The jet stream is at its strongest when the contrast is greatest between cold Arctic air and warm tropical air that vie for dominance over weather patterns in the mid-latitudes. Climate warming forces are causing the jet to shift, and researchers are working to understand the dynamical forces that are at play. Graphics and animation are courtesy of NASA's Goddard Space Flight Center. Select this link to view the lively animation. Enlarge Image. The jet stream influences weather patterns over the northern mid-latitude region, a place most of the world's people call home. Like an atmospheric "steering wheel," the jet stream directs cold fronts and propels warm fronts eastward around the globe. The residents in the mid-latitudes are familiar with typical weather events driven by the jet stream. Yet, like dropping a powerful rock in the atmospheric "pond," climate forcing from greenhouse gases can provoke the jet stream to shift in unexpected ways. Results: Led by Dr. Jian Lu, an atmospheric scientist at Pacific Northwest National Laboratory, researchers investigated changes in the jet stream using a series of climate simulations. These simulations helped them to understand the forces causing shifts in the jet that increase the survival of large-scale weather events, technically known as atmospheric mid-latitude synoptic waves. The surviving waves that peak about 12 miles above the Earth are in turn influenced by forces at the poleward side of the jet that push more energy equatorward as the jet drives eastward. The researchers investigated the impact of these vying forces to understand how climate warming is affecting the seemingly erratic behavior of the jet stream. "This study builds a bridge from an idealized, zonally symmetric world, to a realistic 3-D world," said Dr. Jian Lu, atmospheric scientist at PNNL. "The study transfers our dynamical understanding of the former to the latter." Why It Matters: The mid-latitudes are where most of the world's population lives. It's also where the jet stream influences weather and the water cycle over most of the world's population. When polar air dipping southward collides with rising warm tropical air, the meet-up causes a powerful atmospheric wave with rollercoaster-like patterns that propagate eastward around the globe. For decades, atmospheric and climate scientists have puzzled over how the jet stream is shifting, primarily in response to the increase of greenhouse gases concentrating in the atmosphere. This study pinpoints the key processes that are responsible for the dynamics of the jet shift. It also builds a diagnostic framework with great potential for further development to understand the linkage between a local climate forcing and its global impacts. 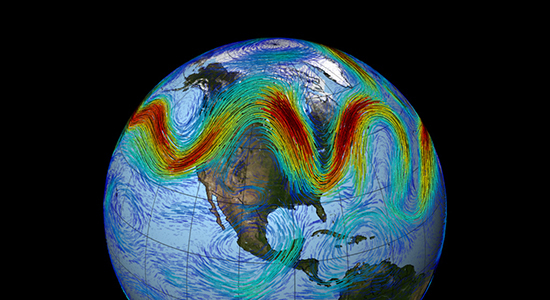 The jet stream is inextricably tied to the global water cycle and the observed increase in extreme weather events, motivating scientists to uncover the mysteries of jet stream activity. Methods: In these experiments, the research team conducted large ensembles of simulations with two state-of-the-art atmospheric general circulation models by abruptly switching the sea-surface temperature warming on from January 1st to focus on the wintertime circulation adjustment. Performing a hybrid, finite-amplitude wave activity budget analysis they elucidated the nonlinear and irreversible aspects of wave interactions while the zonal wind adjusted toward a poleward-shifted state. The experiments confirmed results from earlier more idealized studies, particularly the importance of reduced wave dissipation activity, in which the mid-latitude decrease of effective diffusivity appears to be dominant. What's Next? The natural next step would be developing this dynamical diagnosis toward three-dimensional, local wave activity to explain the dynamical mechanisms at more regional scales. The zonally asymmetric wave response in the subtropics and mid-latitude remains a mystery. It is especially challenging with regard to the local/regional circulation response to global warming. A local wave activity-centric diagnostic framework would be a huge leg-up in tackling this challenging task. Sponsor: The research was sponsored by the Department of Energy's Office of Science, Office of Biological and Environmental Research for the Regional and Global Climate Modeling Program. Research Team: Jian Lu, PNNL; Erool Palipane and Edwin K. Schneider, George Mason University; Paul Staten, Indiana University; and Gang Chen, Cornell University. 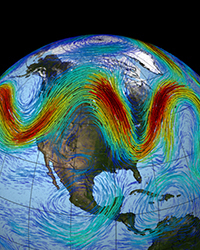 In one sentence: PNNL researchers are uncovering how climate warming is affecting the seemingly erratic behavior of the jet stream using a series of large-scale climate simulations to understand the impact of vying forces on the jet.